What Is Tai Chi for Kids? Tai Chi works on the inside of the body and helps us feel peaceful and focused. It helps us achieve self-control. We begin to understand our needs and emotions and to anticipate a feeling that is building in us. Pretending to be an animal moving peacefully in nature takes us away from the noisy, hectic pace of daily life. Growing up, I knew nothing about Tai Chi. Twenty year ago I saw high school students in China doing Tai Chi to start the school day. The focus, calmness, concentration and ability to work together were amazing. I knew this was something I wanted to learn and teach to children everywhere. So I went back to China several times to study. I saw children in big cities, suburban and rural areas learning Tai Chi. I realized it would be good for pre-school kids, stressed out high school kids preparing for college and everyone in between. It didn’t matter whether a child had ADD, ADHD, or any other learning challenges. I had been teaching for over 30 years in 6 different countries.This deserved a try. Just recently I did a late afternoon session with some tired but rambunctious 4 to 9 year old kids in a summer camp. Tai Chi brought them back to attention with calmness and enthusiasm. It made sense to me. 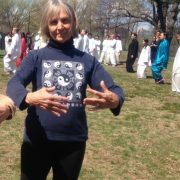 Tai Chi was helping all the young people find inner peace and focus. 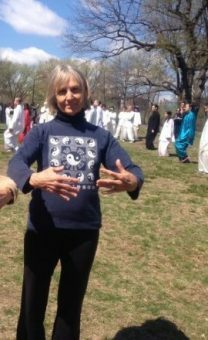 I was so excited by these results that I began using Tai Chi with all my students – the stressed out over achiever, the most hyper active kids who couldn’t concentrate at all, the ones who had no self-confidence and had given up on themselves. The DVD makes it easy to learn the moves. The audio CD for regular practice helps you close your eyes and focus inside. A special ed teacher in Brooklyn used it with her challenging class. one hyperactive boy would throw the chairs around the classroom when he was out of control. Through the regular practice of Tai Chi over just 6 weeks Billy learned to anticipate his tantrum coming on and call out “I need to do Tai Chi!” The whole class would stop to do 10 minutes of Tai Chi together and then go on with their work. In our society we often find that physical education classes and even recess are often cut or reduced. I like to think of children doing TAI CHI MOVES for a few minutes everyday in class and at home to release stress and find inner peace. Sometimes it is not possible to let our kids go outside to play. But they can do Tai Chi. Sometimes bedtime becomes a struggle. Tai Chi can be a beautiful family activity before bed. We can all be sleeping lions. A third grade class I recently taught at the very end of the school day was so relaxed they didn’t even want to go home. “Just a little more! PLEASE,” they asked. Tapping on our bodies is a great morning activity for just 5 minutes. The whole family can wake up their energy and get ready for the day. The best time to start is in elementary school – when children are developing study skills and habits. As they grow, Tai Chi reminds them to breathe, stand straight, relax, visualize, focus, and release stress. It enhances creativity, too. Of course it is also great in middle school, high school and for adults. Once learned, it is the perfect exercise. It can be done in a few minutes, here and there, throughout the day. And it requires no equipment. Just a little bit of time! My dream is that parents and teachers everywhere will discover Tai Chi and learn to use it with their children so everyone can find the inner peace that can change our lives. Learn more about the studies that have been done on kids and Tai Chi. China to study and understand the movements, the background, the health benefits and the powerful inner peace and focus. Since I love teaching I soon began sharing it with my friends and students at school. Everyone enjoyed the movements imitating animals and nature. Children and adults loved the relaxation, imitation, visualization and imagination involved in Tai Chi. It feels good inside and out. For athletes, Tai Chi helps focus the eye on the ball. When taking a test, Tai Chi helps to send oxygen to the brain so you can think more clearly. Tai Chi also opens the flow of energy to all parts of the body including the organs, nerves, brain and muscles. The practice of Tai Chi helps to reduce blood pressure, anxiety, mood swings and depression. Our balance and flexibility improve. We become healthier by enhancing the immune system. Studies show a relationship between physical activity and development of self-esteem. This is true for elementary aged children, adolescents and adults. The flowing, gentle, movements, relaxation, visualization and breathing make all the difference. Children who do Tai Chi just 10 minutes a day feel less stress. Adults can do it too and release their stress. I always suggest doing a few minutes of Tai Chi before a test or important performance. As you breathe and visualize, your shoulders and stomach relax. That tight feeling in the abdomen goes away. The blood begins to circulate more freely. We become rooted and centered. The mind focuses on the task ahead. Even a three year old can do it. Imagine a classroom where students practice Tai Chi regularly. There is an atmosphere of calm focus and cooperation. Teachers tell me that on the days they do Tai Chi everything works better. Their students develop the self-confidence they need to find success. They are flexible and balanced, free of excessive fears and anxiety. Kids with special needs such as ADD, ADHD, autism, poor concentration, low energy and other disabilities can improve their focus and self-control, their ability to relate to others, to stay on target with their work and believe in themselves. Isn’t it wonderful that we have a tool to help us deal with the ever-increasing level of stress in our lives? Isn’t it even better that now we can share it with our children? Read about what kids say about Tai Chi.